Best Season : Summer is best season for tourists. Winter is very cold here. Snow in winter. Cloth Required : Heavy woolen cloths in winter and light cloths in summer required. Binsar situated at height of 2412 mts and about 30 km from Almora. The place offers a wonderful view of the Himalayas. The Chand Kings (7-8 century) used to camp here during summer. The region around abounds in alpine flora, ferns, hanging moss and innumerable species of wild flowers. A walk through the woods comprising mostly oak and rhododendron forest, leads to a vantage point at the summit.The view of sunset on two hilltops is the best attraction of binsar. Binsar is a beautiful destination for those who need peace in their life and not want to go any crowded stations. Train : Nearest railway station is kathgodam 100 km from binsar. 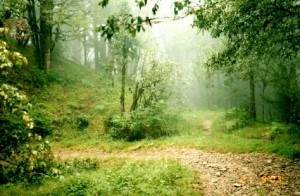 Road : Binsar is 30km from almora. This entry was posted in Binsar, Uttaranchal and tagged best time to visit binsar, binsar india, binsar map, binsar photos, binsar temperature, binsar tourism, binsar uttaranchal, binsar weather. Bookmark the permalink.